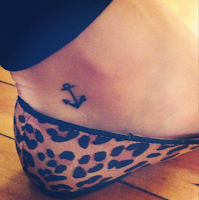 I spy with my little eye a tiny little anchor...on my ankle! Finally, after months of planning, my sister and I finally got the matching tattoos we have been dreaming about getting together. It all happened last weekend on my trip home to Wisconsin. I know not everyone sees the value in tattoos, and that's OK. I like tattoos. And my sister loves them. Tattoos really speak to her in a way that I'm not sure I'll ever understand, but absolutely appreciate. So when the thought of getting matching tattoos came across our minds, it stuck. 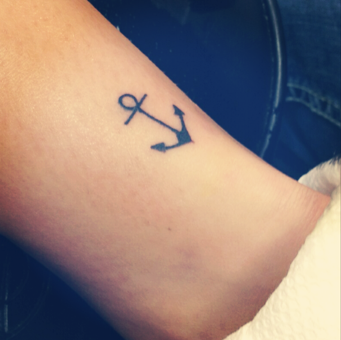 And for us, the anchor was a perfect fit. Our bond as sisters anchors us together, and at the same time, we are each-others anchors. Always there for one another, weathering the storm or sailing under sunny skies. I love the anchors, and I love her. And I love our tattoos. So with that, happy Friday!